I’ve gotten to the point in my life where I am caring about how I look more than ever before. I am in my early 30’s, I have made my way back to the same weight that I was in high school, and I am building a little muscle in this bod of mine. Trying to keep up with a wife that just looks better and better as the years go on is really hard. I need to make sure that I don’t slack off in the fashion department not only so I can be seen in public with my wife but at the same time hope to never embarrass my kids by ever becoming the lazy-out-of-touch-with-society-these-days type of dad. I have had to get rid of a good bit of clothes that are too big for me now. I have replaced those clothes with new clothes that are really nice and family approved. Once I got the shirts, the pants, and the shoes I knew that I had to work on the other items that would compliment a new wardrobe. I am not a hat person so I didn’t have to worry about that. The biggest thing to worry about now would be a new jacket and this is where Lands’ End comes in. The fine folks at Lands’ End sent over a Lands ‘End Men’s Hooded Down Jacket. Starting off with the outside of the jacket I found that the windproof nylon shell features a water-resistant finish to repel rain and snow. There is a storm flap and oh-so ingenious concealed fleece storm cuffs that keep cold from sneaking in. The adjustable, insulated hood stays put on your head — even when Old Man Winter starts to blow. There are eight colors to choose from but if you know me I really tend to stick with black. Feel free to brighten things up. 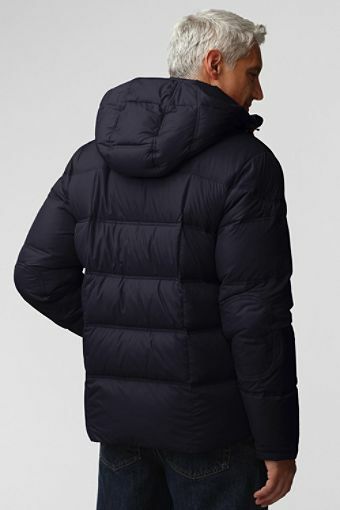 On the inside you’ve got a lightweight inner lining that is packed with 600 fill down so you can bundle up without looking like the Michelin Man. There are some simple yet very practical details that include, zippered side pockets, a zippered chest pocket, and finished off with an adjustable drawcord hem. Another good thing is that when after you are done getting all wet and dirty (but still staying warm) outside you can throw this guy in the washer and dryer and be done with it. Maximum warmth without traditional down bulk. I think anyone that needs a seriously warm jacket should snag this one. 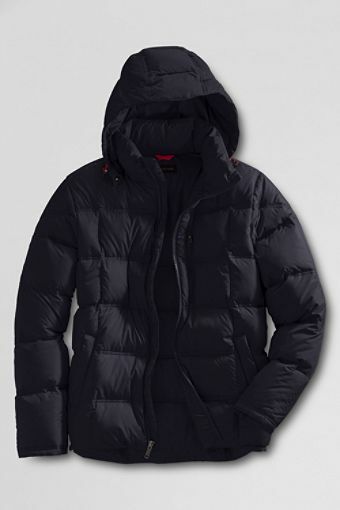 It is rated one of the warmest jackets out of all of Lands’ End inventory. I really like the fit and features of this jacket and if I had to say one negative thing about the jacket it would probably be that there are no layers or control to the warmth it provides. I guess I really kind of got spoiled with my other Land’s End jacket from previous winters where you had three different ways to wear that one. This time of year is really rough on my skin. Fall and then winter really work a number on our dermis and cold temps usually aggravate skin conditions. With me being active at work for 10+ hours a day and also having an extremely physical job I need something that not only keeps me feeling clean, but also keeps some moisture in my skin. Many dudes put up with cleansing products that are harsh and drying, without realizing these products leave their skin feeling dry, irritated and uncomfortable. 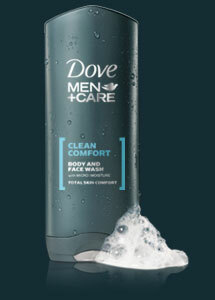 Dove Men+Care Clean Comfort Body and Face Wash with Micromoisture technology is clinically proven to fight skin dryness better than regular men’s body wash. I don’t usually like smelling like a girly-man with all these body washes that are out there. This body wash was formulated specifically for men who prefer a mild, unscented body and face wash.This ultra-light formula rinses off easily for a refreshing clean and total skin comfort. Also, the Active Clean Shower Tool was created to give an even better body wash experience by delivering maximum lather and maximum scrub in each shower. 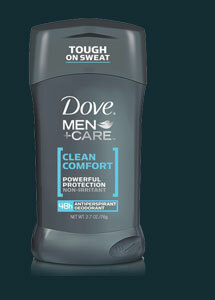 The first scented antiperspirant/deodorant from Dove specifically designed to give men protection—without compromise. Its unique formula combines one of the most effective ingredients for 48-hour protection against odor and wetness with non-irritant 1/4 moisturizer technology. I hope that you all say hydrated this winter inside and out! Growing up I watched my fair share of cartoons. I loved Transformers, Masters of the Universe, GI Joe, Gimmie a Break….okay that last one I really liked in the 80’s but it was not a cartoon. Bringing in some of the love that I had for my childhood shows to my daughter has not been that successful. There was one show that I did watch in the afternoons that wasn’t so action oriented. It wasn’t a show so worried about saving the world as it was worried about finding the best outfit to wear during the next big music performance. 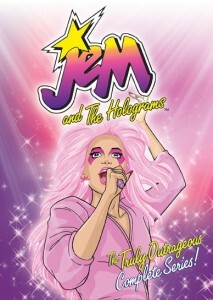 That show was Jem and the Holograms. After showing Jem to her on The HUB my daughter could not get enough. But, don’t take my word for it…I will let her fill you in on the series. In 1985 the “truly outrageous” TV show JEM And The Holograms premiered to the delight of young girls and boys. This new animated series focused on the dual life of beautiful Jerrica Benton, co-owner of Starlight Music, and her pop star alter-ego, Jem, lead singer for the all-girl band JEM And The Holograms. Some of my favorite peeps over at Shoutfactory! you can relive the adventures of JEM And The Holograms and their archrivals, The Misfits and The Stingers, in this first-ever complete collector’s edition 11-DVD box set. All 65 episodes of the hit series are included, accompanied by an EXCLUSIVE bonus disc of brand-new and archival material rarely seen! Definitely a great pick or this holiday season! I see families all the time that are all at home and they are all spread throughout the house doing their own things. They don’t talk much together, they don’t laugh near enough, and they don’t share much with each other at all. Families thrive when they are built on unity. They are built on the basis that parents have the responsibility to raise their children to the best of their ability and the children have the responsibility to strive to become an adult while all parties are loved, cared for, and respected by each other. Families have not always been just “mothers, fathers, and kids”. Grandparents might take on a good bit of time with their grandchildren in a single parent home, aunts and uncles may take over custody after a family tragedy, or a foster family might welcome new siblins to the family from several different ages or ethnicities. 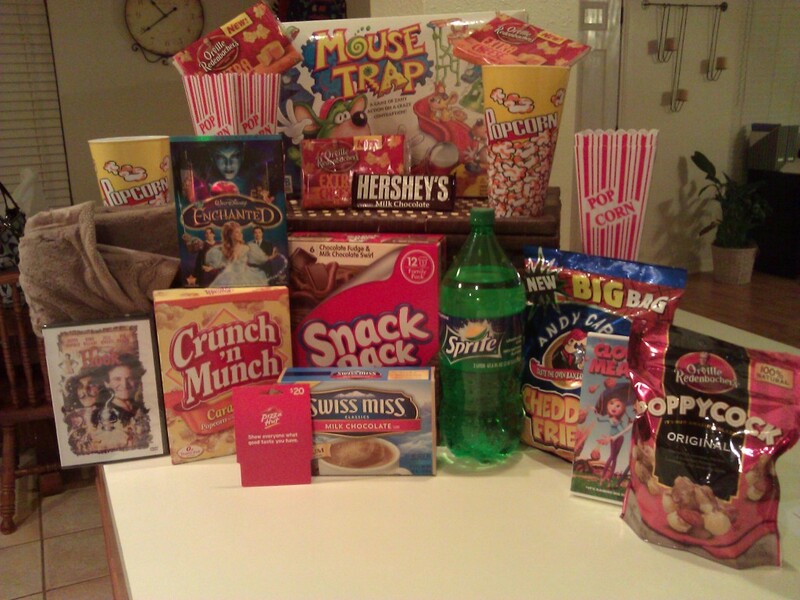 Some of my fondest memories growing up was when all of my family got together and just had a movie night. Whether it was rented from the video store, pulled out from our own collection, or watched it over broadcast TV it was an occasion that defined a great day. One thing that is no doubt a huge part of movie experiences is popcorn. One company that has been getting popcorn right for over 45 years is Orville Redenbacher. Popcorn is good on a normal day, but what if you ramped your popcorn up a little bit with some “extra” flavor. Well, here comes Orville Redenbacher’s Flavors to the rescue! These packs of popcorn perfection are available in White Cheddar, Extra Cheese and Sea Salt & Vinegar. These bad boys allow you sprinkle on your flavor fave to add a little bit of “heaven in a pouch” to your popcorn. I tried the popcorn out for myself and thought that I really wanted the entire packet throughout the bowl. It had such an intense flavor and the kids just went crazy for it. My wife Crystal doesn’t really care for huge amounts of cheese (I know right! What’s wrong with her?) so popcorn like this may not be for her…but wait…I told her she could control the amount of cheese that the popcorn had on it. Talk about having some some of control over things in this house! I was also tasked with the job to create a basket that revolved around a family movie night and the best flavor of all….Extra Cheese! Here’s what I thought would be a rocking basket to make sure the night is a hit! Orville Redenbacher’s Flavor Singles Extra Cheese – Start the night off with some and fix some more when you start up the movies. You can control the cheesy flavor, but you can’t control your craving for more. Popcorn Cups – Well…to put popcorn in. Cheddar Fries – Like if there wasn’t already enough cheese…here’s some more. Soda – Gotta have some soda. I just couldn’t find any cheese flavored brands. Enchanted – Because you know fairy-tales coming to life would seem pretty cheesy. Hook – Because it is equally a kid and an adult movie. Cloudy with a Chance of Meatballs – Funny family film that has many opportunities to see really big cheese topped foods. A Blanket – Because some people just need to snuggle during a movie. Either that or their iron is low. Crunch ‘N Munch and PoppyCock – Because there are both fun to eat and one is really funny to say in a British accent. Pizza Hut Gift Card – Cheese makes up 36 percent of pizzas. What else would you eat with so much cheese? A roast? Mouse Trap – Fantastic game that revolves around the love of cheese. I really admire those critters. Snack Packs and Chocolate – Gotta bring the sweetness in at the end of the night. 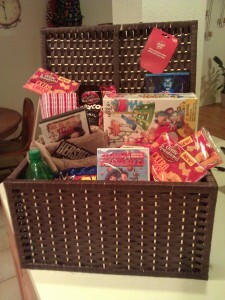 A separate (but similar) Family Movie Night gift basket valued at $150! Product samples of the new Orville Redenbacher’s Flavors! Tell me do you think you’ll snack on Orville Redenbacher’s popcorn more now that it comes in new flavors? Which flavors are you most excited to try? This giveaway will end on October 26th at 10:00 PM Central time. Winner will be chosen via a random number generator. Giveaway is open to US entries. The winner must contact me in 24 hours to claim their prize. Good luck to everyone! Growing up in the digital age is so beneficial for the children of today. Just because we as parents didn’t grow up in this age doesn’t mean we can’t take part in it and enjoy it too. Pampers has come out with two sweet apps that make pre-birth to several years down the road fun for parents who want to stay involved with their children and watch their development. The Pampers Hello Baby Pregnancy Calendar allows you to explore life-sized images (iPad only; images in iPhone and iTouch are not life-sized) of a baby in the wormb from week 4 up to week 40. Learn about the stages of pregnancy and make small discovers about a baby’s development. Did you know that a baby could respond to sounds by week 28? The “womb translator” feature allows you to record your voice, then play it back or share it with friends in the tone that your baby hears it. Download Hello Baby for free through the iTunes App Store here. and experience baby development like never before—at simulated life-size, right on your iPad. The Pampers Hello World Baby Memories lets you take daily photos of your baby and then easily create a time-lapse video so you can watch your baby grow. You can use Growing Baby for anything—a developing pregnancy bump, the growth of little fingers, hands, and feet, or a baby’s facial features. You can record his evolution for days, months or even years and then watch it in seconds. Download the Hello World for free through the iTunes App Store here and make memories daily with your kiddos. These are really outstanding tools for parents to use to get closer to their kids before and after the birth. I kind of wish they were around for us to use when my oldest was born. Don’t get any ideas…we are done. Your favorite part of pregnancy and baby years! Follow Daddy Digest on Twitter AND Tweet about the giveaway with the hashtag #PampersHelloApps. Leave the URL to the Tweet in your comment. You can tweet once a day, but remember to leave the URL to each tweet. This giveaway will end on October 22nd at 10:00 PM Central time. Winner will be chosen via a random number generator. Giveaway is open to US entries. The winner must contact me in 24 hours to claim their prize. Good luck to everyone! Since I have been eating better for a good bit now I have come to the realization that I like when I find those foods out there that are full of flavor yet still are not full of fat and calories. 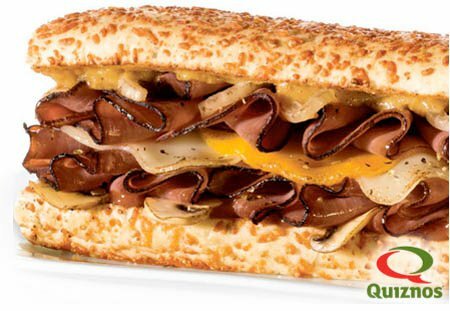 Quiznos has a returning favorite and it is the Black Angus Beef Sub. It’s a sandwich that is easy on your wallets and low in the nutrition baddies. Available for a limited time only, the sandwich lets diners indulge their palates in a smoky, sweet and spicy flavor combination without sacrificing their wallets (at only $5.19) or their waistlines (at 520 calories). The sub boasts thick slices of premium Black Angus beef, mozzarella and aged cheddar melted over sautéed mushrooms and onions, all on toasted Rosemary Parmesan bread. Plus, it’s finished with two sauces – a smooth layer of Honey Bourbon Mustard followed by a light drizzle of zesty Grille Sauce. This sandwich made me smile! I did not get it on the Rosemary Parm bread though because I am not a huge fan of having bread that tastes like pine trees in it so I subbed the wheat for it and it was still delish as could be. If you are watching your bank account and your waistline then this is the sandwich for you. Get up and head out right now to your local Quiznos and pick one up…or wait till you can WIN ONE! A $15 Quiznos Gift Card. Tell me which one matters more right now…your wallet or your waistline! This giveaway will end on October 10th at 10:00 PM Central time. Winner will be chosen via a random number generator. Giveaway is open to US entries. The winner must contact me in 24 hours to claim their prize. Good luck to everyone! When I was really young my parents split. All I really knew was my mom growing up. My dad was around when the shared custody let him take me every other weekend. I didn’t understand what was really going on and at times I thought my dad just didn’t have time for me or I wasn’t a fit for his life. I loved a movie growing up that had a great father-son element to it. That movie was Over the Top. This movie featured Sylvester Stallone and his character was trying his best to get acquainted with this boy that he really had never even met. This boy was his son and was now going to spend some time with him since his mother had died. They travel the country and reconnect while Sly’s character competes in arm wrestling competitions. This was an epic movie for me because the movie had a super message about a man who cared very deeply for his son even though he hadn’t ever got to spend a ton of time with him and didn’t always know how to show his feelings when he was finally around him. Now that I am a father I have been looking for that one gem of a movie that could define that “father-son” feel for the next generation and I think I may have a winner. 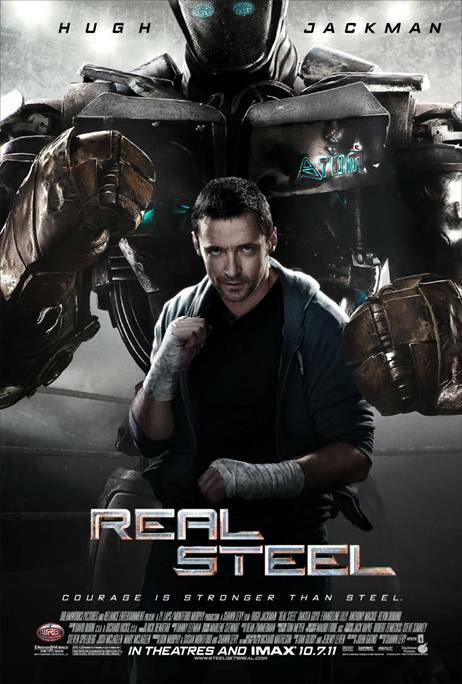 I recently took a trip out to L.A. to check out a screening of the new movie from DreamWorks Pictures called Real Steel and at first I just thought this movie was going to be a “Rockem’ Sockem’ Robots” ripoff. Boy I was way off! 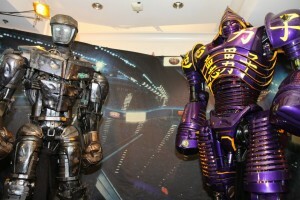 These robots were absolutely stunning in being the next step in the sport of fighting. See, it is the year 2020 and the game of competitive fighting has changed quite a bit. In the years prior, human fighters could only dish out and take so much physical damage before something in either fighter’s body gave out. This was not a good problem to have when you had audiences that wanted more and more brutal fights and finishes in regular bouts. In 2014 Human fighters were then phased out and replaced by robot fighters that were controlled remotely by human operators. There is a huge market for these robots to fight in from small town sideshows to the big time events in the World Robot Boxing league. In the WRB, robot fighters stand over 8 ft tall, weigh in at a whopping 2,000+ pounds, and fight to the death! You must be thinking “Ryan…I thought you said that this was a family movie?” Indeed it is. The film revolves around Charlie Kenton (Hugh Jackman), who is a old school human fighter who lost his chance at ever being the champ. Now he spends his days and nights scrounging around and trying to find any pieces that can be assembled to make him a working bot to make a little money, Charlie drives around from one underground boxing venue to the next. When things don’t exactly play out the way Charlie really wants them to, he is abruptly confronted with his estranged son Max (Dakota Goyo) and their story seems to start on rough waters. They find a robot by chance and begin to bond over the sport of fighting and strengthening their relationship through their wonderous journey to the top of the league. I think that this is an awesome movie. A real action packed film whose characters strive to break records and mend relationships. Real Steel reminds me of many of my favorite movies like Over the Top, Rocky, and sprinkled with a tad bit of Transformers. This movie is rated PG-13 and is suggested to be a family film. I do think that every one of my kids would love this movie and think it is one of the best family action films of all time but there are a few concerns. The violence of fighting robots is okay but the atmosphere of emotions tied directly to the characters (human and robot) that take a beating is quite brutal. There are a few instances of language and I’m not a person who totally blows off a movie for a few curse words but when it has an eleven year old saying them to his father it makes me heed on the heir of caution. I just don’t want my kids thinking it is okay to say them because a child said them to his father in the movie. I don’t have the excuse of telling my kids that those are just “grown up words” when someone so close to their age just rattled them off. The kid says a** two times (one time calling his dad an a**), he also says sh*t once, and there are a few other mild profanities. All-in-all this was a knockout of a movie that will leave you wanting to continue on the adventure. I look forward to sharing this movie with my children in a couple of years with me beeping out the bad words or just skipping through those scenes. I hope that they see it not only for a movie about a fighting robot and his rise to the top, but the fight of the heart between father and son. Anyone that really knows me knows that I really love to eat. I have changed my eating habits a great deal over the last year to get in better shape and to improve my way of life. I do however still have the occasions to where I eat whatever I want and how much I want. 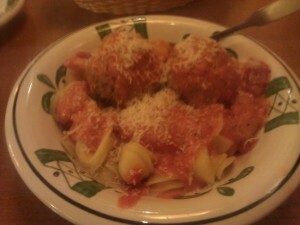 What a coincidence that Olive Garden has their Never Ending Pasta Bowl going on now until October 9 and it’s only $8.95! I took a little trip on over to my local Olive Garden with my wife attached to my arm and a growling in my belly. We sat down and immediately wanted to get our order on. We took a pass on the wine and got our usual Diet Cokes and then sat there in front of the menu and pondered on what we were going to scarf down. It took me about 1.7 seconds to figure out what pasta and sauce combination I wanted to start out with first. I ordered the Never Ending Pasta Bowl with my selection being the Orecchiette with Five Cheese Marinara. I always get the Zuppa Toscana soup instead of the salad and managed to only eat one bowl of soup in anticipation of the pasta goodness coming my way. Crystal set her sights on some seafood pasta dish and had the same soup. You can also add unlimited servings of either meatballs, Italian sausage, or grilled chicken breast to any of your pasta dishes for an additional $2.95 and I added the meatballs to my first bowl. The second bowl that I created was the Orecchiette with the new Pizzaiola Meat Sauce that is a pizza-inspired red sauce with Italian meats (pan seared beef, Italian sausage,and pepperoni! ), mozzarella and fontina cheese. I topped it off once again with magnificent meatballs. On my third bowl I knew that I was already down for the count and asked just for a bowl of meatballs swimming in the Five Cheese Marinara sauce. Build your pasta and sauce combination at www.NeverEndingPastaBowl.com. All-in-all we had an exceptional dinner together just my wife and I. Before we left though I did have to ask our wonderful waiter, Ryan, in his experience what is the most popular combination of all time. His answer surprised me when he said “regular spaghetti and meat sauce”. WOW! A $25 Olive Garden Gift Card. Tell me whether you prefer soup or salad! This giveaway will end on September 29th at 10:00 PM Central time. Winner will be chosen via a random number generator. Giveaway is open to US entries. The winner must contact me in 24 hours to claim their prize. Good luck to everyone! When I got my iPad a couple of months back I immediately thought of all the accessories that I wanted to start looking at to pimp it out. I had actually been going back and forth wondering if I really could use an iPad or if it would just sit there and be used only for occasional games. Are they too big and delicate to even be in this house with all of these kids running around? I needed something to protect it but I also wanted to maybe just take it along with me when I travel instead of lugging around a standard laptop. I knew that I did not like typing out long emails and blog posts with the onscreen keyboard. I make enough mistakes on a regular keyboard and I make even more with the onscreen virtual keyboard. I think I should just stick with what I make the least mistakes with and keep the auto correcting of my blundering fingers to a minimum. So, I sought out some solutions in the form of my friends over at Logitech and their selection of Bluetooth keyboards to suit my bumbling typing needs. 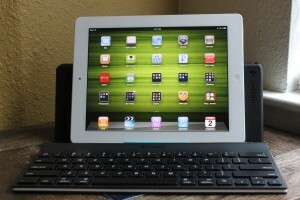 I tried out two products with my iPad2 and those products were the Logitech Tablet Keyboard For iPad and the Logitech Keyboard Case for iPad 2. You can find both of these items over at Logitech’s site. 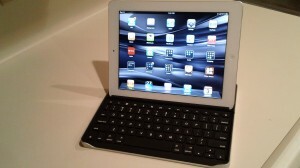 The Keyboard Case for iPad 2 retails for around $99.99 and the Tablet Keyboard For iPad retails for around $69.99. Also keep up with Logitech on Facebook and Twitter to see what other sweet products might be coming your way. From the vault comes a Disney classic that is sure to appeal to every member of your household, it’s The Fox and the Hound. This 1981 movie brings together a stellar voice cast that includes Mickey Rooney, Kurt Russell, and Corey Feldman. The 2006 sequel has the voice talent of Patrick Swayze, Reba McEntire, Lucas Grabeel, and Trisha Yearwood. 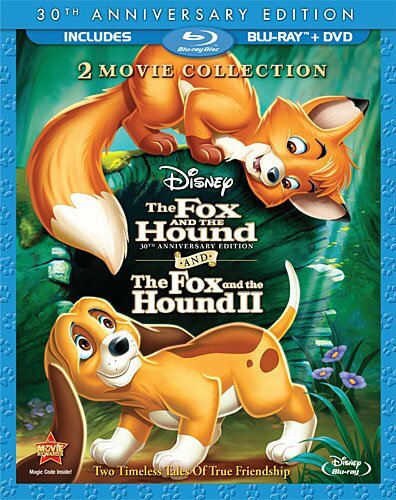 The Fox and the Hound Bluray and DVD combo pack was released on August 9th, 2011 and is available at most retailers we drag our kids to and online. Seriously, you need to check this movie out with your kiddos. I think that it shows no matter where you grew up, no matter what your story is, no matter what hardships you went through we always have a choice in our own lives in the friends we make and the bonds we share. We have a choice to always have that childish wonder about us and to never have to worry about what a person looks like, their financial status, or even their race. The Fox and the Hound shows that friendship and the love and care that go into it is a very powerful thing that can stand the test of time. I sure hope you guys enjoy this movie with your family as much as we have. From my teary youth to my kids trying not to cry in front of each other on the couch this movie has been an awesome addition to our collection!